This Home Equity Loan Calculator helps determine your Home Equity Loan or Home Equity Line of Credit payment. You may calculate what the payment is for a specific loan amount, or, alternatively, you may enter your desired payment amount and see how much of a loan you may obtain for a specific monthly payment. For a Home Equity Loan payment, select fixed-term loan (closed-end loan). For a Home Equity Line of Credit payment, you can choose 2%, 1.5%, or 1.0% of the outstanding balance, or interest only. 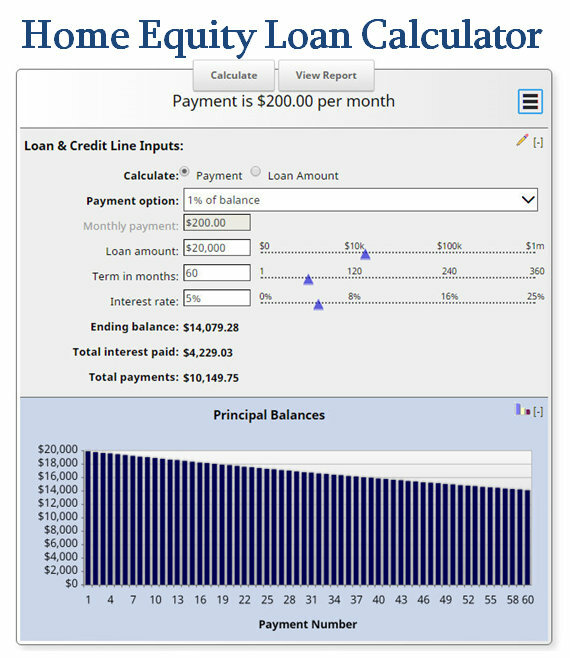 Chose your options on the Home Equity Loan Calculator below and click on the "View Report" button to see a complete amortization schedule of your home equity loan payments. See below the mortgage calculator for additional definitions. Looking for a different mortgage calculator? More Mortgage Calculators Here. You may also email the results by clicking on the three-line icon in the upper right hand corner of the mortgage Calculator.